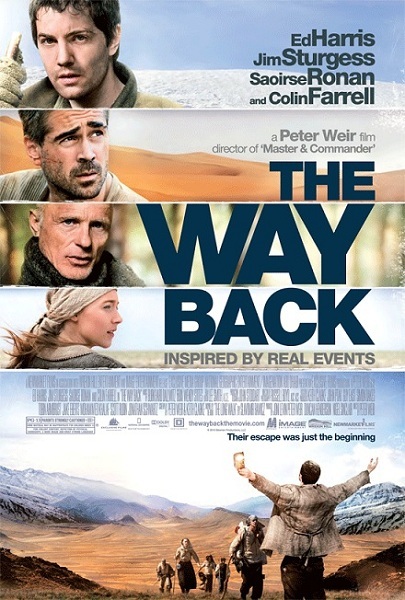 The Way Back...what is this movie? You are probably asking yourself that very question and rightfully so! Where has the P&A for this film been? I happened to stumble across a trailer online and I have had it posted for some time at the bottom of the blog, but there has been far too little pub for a weighty movie like this! 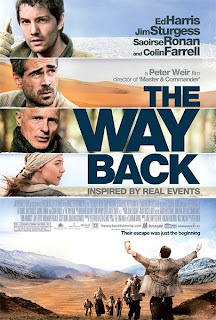 THE WAY BACK opened on only 650 screens this weekend, so it may be difficult to find it, but do so if you can because it is worth it. Peter Weir is a 6-time Oscar nominated filmmaker. His previous work includes Master and Commander: The Far Side of the World and The Truman Show, the only two films besides The Way Back that Weir has done over the last 13 years. He was most active in the 70's and 80's and gave us such films as The Mosquito Coast, Green Card, and Dead Poet's Society. He is a talented director with a rich catalog and he again has done his part in creating a fine film. The cast in film is top notch with Jim Sturgess leading the charge as Janusz, a Polish man who is sent to a Siberian Gulag to serve 20-years for spying, and as with many charges during times of war, it very much seems to be a hopped up and baseless charges. Once in the Russian Gulag, he meets a random mix of folks and in very short order, a group forms that makes their escape. The film only sticks around in the prison long enough to show you the terrible conditions, then the movie hits the road on an epic walking tour of the countryside that rivals even the long walk in Lord of the Rings. I have been a Jim Sturgess fan ever since ACROSS THE UNIVERSE. In fact let me take a moment to plug Julie Taymor's 2007 re-imagining of some of The Beatles greatest songs in what was one of my favorites of that year. 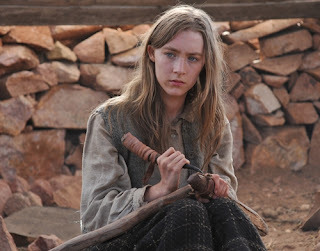 The rest of the cast includes Mark Strong, Ed Harris, Colin Farrell, and Saoirse Ronan. Ronan in particular is truly a rising star. From her Oscar nomination several years ago for Supporting Actress in ATONEMENT, she is spectacular. I can't wait for HANNA this spring, in which she plays an assassin. A star-studded film that is sure to be original and enjoyable. Colin Farrell is decent as well. I think since moving away from the cheese-ball action stuff of the early 2000's, Farrell has proven himself to be a very talented actor! Don't believe me? Check this flick out or even better, check out In Bruges, his Oscar nominated turn in 2008. 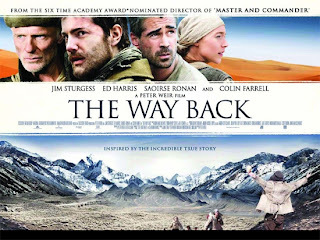 As for THE WAY BACK, it is based on the book by Ronald Downing: THE LONG WALK: THE TRUE STORY OF A TREK TO FREEDOM. Downing had been told the story from Slavomir Rawicz and he acted as the ghost writer. This book documents the escape of Rawicz (portrayed in the film by Sturgess as Janusz). The story surrounds the escape of the prisoners in 1941 from the gulag and their subsequent 4000 MILE walk through the GOBI DESERT, through the HIMALAYAS, into the British controlled portion of India, over the course of 2 years. The veracity of the book has been called into question over the years and many say it is just a bunch of anti-Russian propaganda. Visit the Wikipedia page to get the "facts" on the matter, but I say this, regardless of the veracity, it all makes for a hell of a movie. It doesn't have to be true to be cinematical. Most of what we find compelling to watch has no truth to it whatsoever! The Gobi desert scenes are masterfully shot and the make-up and costume work for these scenes are great. 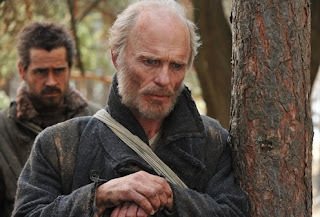 Ed Harris is both emotionally and physically transformed through this film. But it really is enjoyable across the board and his is just a sample of the fine acting within the beautiful cinematography that makes up this film. Best Picture, Best Director, Best Supporting Actor, Best Cinematography. At the end of the day, go see this movie. A 4.5 of 5 rating for the film...it is 2 hours and 13 minutes and my only complaint that it is a bit too compressed at the end. You get a feel that you are not being told everything that is of interest with regard to this journey and instead, the finale is a newsreel montage. At least one additional scripted portion during the ending would have made this a better film. More to come this weekend, I promise. The Kid in the Helmet is working up some info on NO STRINGS ATTACHED, a film that the Reel Rhino will not be catching, most likely. Also, I have a friend who touched down in Utah yesterday and I am hoping for updates from the trenches of the SUNDANCE FILM FESTIVAL. MOVIE DAY: And Don't Call Me Shirley! Meddy New Year...Let's Talk Movies!